The kilim shoes are made from original handmade kilims, so each pair is unique.The shoes shown in the picture have the size of (EU35 - USA5) but we may carry diffrent sizes of same model with diffrent kilim design. 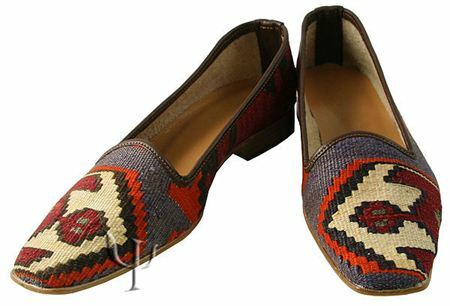 We are manufacturer and exporter of kilim bags, kilim shoes & boots, kilim furniture and Scarlet bags & shoes. Copyright © 2019 Kilimbag.com. All rights reserved.